Died at the family residence in North Olathe on Thursday, December 14th, Miss Gertrude Canutt, aged 14 years, 4 months and 11 days. The funeral services were held at the M. E. church Sunday, December 17th, at 3 o'clock p. m., conducted by Rev. McQuoid and Rev. Richards, and were attended by a large number of friends of the familv. Miss Gertrude had been a great sufferer from an injury to her arm, sustained while living at Fort Scott last year, but her condition was not considered serious until recently, when it was discovered that the bone was diseased and that amputation would have to be resorted to for any chance of saving her young life, and that a doubtful one. 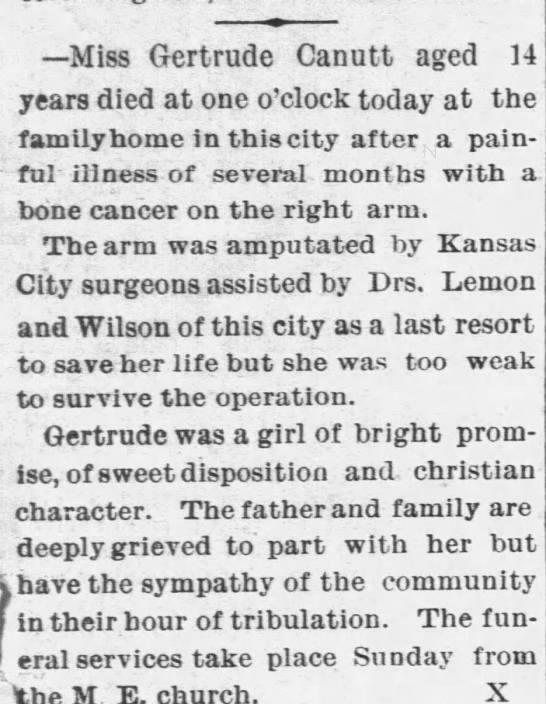 On Thursday the diseased arm was amputated by two surgeons from Kansas City, assisted by local physicians, but the shock was too great to be borne in her weakened condition and the sufferer passed gently away without recovering consciousness from the effects of the anesthetic administered at the time the operation was performed. Miss Gertrude was a bright and interesting young lady, and was taken away at a time of life to be missed the most by her family and many friends. Miss Gertrude Canutt aged 14 years died at one o'clock today at the family home in this city after a painful illness of several months with a bone cancer on the right arm. The arm was amputated by Kansas City surgeons assisted by Drs. Lemon and Wilson of this city as a last resort to save her life but she was too weak to survive the operation. Gertrude was a girl of bright promise, of sweet disposition and christian character. The father and family are deeply grieved to part with her but have the sympathy of the community in their hour of tribulation. The funeral services take place Sunday from the M. E. church.